D.A. 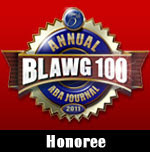 Confidential: Circular reasoning - it's easy! We have a fairly new roundabout near our house, in a shopping center that we use frequently. 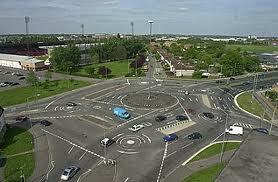 Now, I'm well aware that I grew up using roundabouts in England and Europe, and that they're not so common here. It's really pretty easy. You drive up to the damn thing, see if the road is clear, and then enter slowly, missing the concrete curb and not driving over the grass. Like I do. Serious question: do they not put these on the tests over here? Three times I've almost been whacked by some idiot sailing right into the roundabout as I'm going around it. And what chaps my grits the most, is that when I honk and look horrified (the latter being automatic and unintentional) I either get blank "WTF did I do?" looks, or straight outrage at being in their way. Look, I know they are new to your culture. But don't you think, if you come across some traffic furniture you are unfamiliar with, the prudent option is to slow down? Maybe even stop while you figure it out? 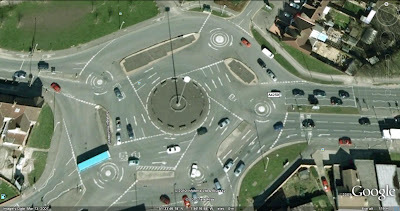 I mean, if roundabouts help (and I think they do) then we'll only be seeing more of them. And that means, they'll be getting more complicated. So unless you want to kill or be killed, I respectfully suggest, dear drivers of Austin, that you acquaint yourselves with the roundabout. I completely agree with you, Mark. I've been exposed to both the European roundabouts and the American ones, and I can honestly say that even though they get crazy, I prefer the ones in Europe. Growing up here in North Texas I was exposed to only two, that I can recall. One is in the south side of Fort Worth and it was Blue Bonnet Circle. It was never that bad, though it has been a long time since I've navigated it. The second is in west Fort Worth, and even though it isn't located in Weatherford, it is called the Weatherford Traffic circle. To this day it is a nightmare. That roundabout is terrifying. There's one that I regularly travel in the DFW area, and it's not bad--but the first time, when I'd never even seen one before? I was getting honked at for being a turtle. When in doubt, I apply the brake and slow down, angry people be damned. If I ever come across one similar to the Swindon example, I may just die of fright. The roundabouts in Mexico are called glorietas, because they will send you to glory. Sharing those with homicidally macho Mexican drivers took years off my life expectancy and gave me my first gray hairs. I lived, and drove, in Europe long before the EU silliness came about. At that time, the "roundabout rules" were not uniform. The Germans had one rule, so the Belgians and French naturally had another. In one country the entering traffic had the right of way, so you could sail right into the middle lane and everyone had to stop for you. In the next country, the traffic IN the loop had the right of way. Entering traffic had to stop and wait for a break. Then you went to the UK, and they were going the wrong way around the circle in the first place! Plenty confusing there also! We don't have very many of them here, and at least in Illinois, they're not on the test. They've been so rare in my area that you can refer to this one here as "suicide circle" and everyone for miles around will know what you mean. We've had roundabouts in my little town for near on a decade now, but drivers seem to treat them in two ways: either they race through the roundabout as if the yield sign means "stomp on the gas" or they stop IN the roundabout to let traffic in. That roundabout is awful. And I thought our local engineering disaster (http://www.shopsatgreenoak.com/roundabouts.html) was bad enough. There used to be a really complicated one in Colchester when I started driving... very good for the soul. 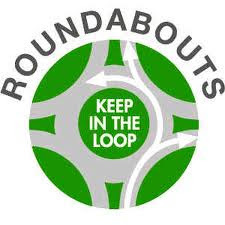 There are some rotaries, as they are called there, around Cambridge MA which can be tricky if there are too many drivers around who are unfamiliar with them. They're so new in Texas I doubt they're on the test, and the first time you enter a big one they can be confusing and scary. To make matters worse, the first one I drove in was a massive one in Paris that made my head spin and left me white-knuckled and terrified. But once you understand the rules, they're a LOT safer than red lights and statistics say there are far fewer accidents (especially T-bones) at intersections with roundabouts as opposed to red lights. That said, they installed a kind of pointless one in my neighborhood by the train station near MLK and I've twice seen cars cut through the wrong way; bicyclists even more often. I'm for traffic engineers using them more, but you're right they need to teach folks how to navigate them.